I’ve written previously that our chickens have been getting idle threats that they are heading to the stew pot if they don’t start laying soon. This threat is made even more idle by the fact that I don’t even eat chicken. When we bought the chickens in August, we were told they’d start laying in a few weeks. Clearly, the chickens were younger than we thought. Nine weeks after getting our chickens, I opened the coop today to find two eggs! Now they actually deserve the big chicken coop/run extension that Derek has been building. This project will be done this weekend and we’ll be sure to post pictures of the “north wing” in a few days. Update: I had a request to see a picture of the egg yolk. 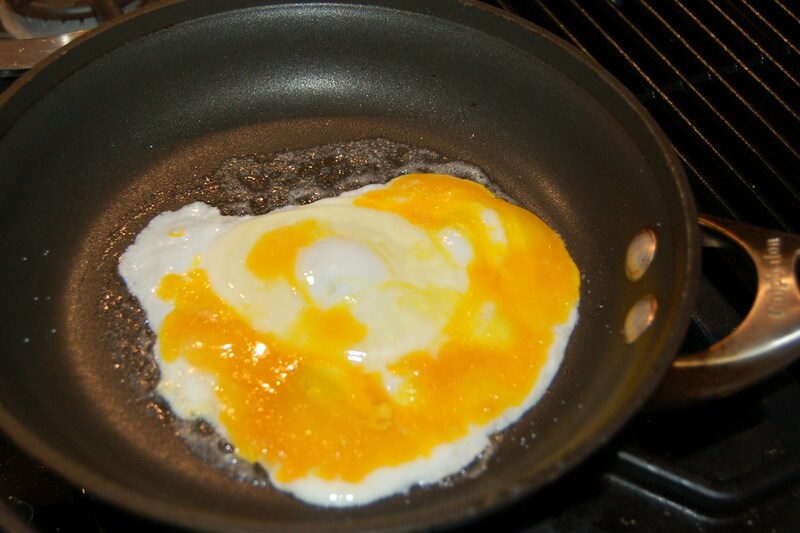 The yolk is much closer to orange than the paler yellow you tend to see in store-bought eggs. This entry was posted in Homesteading and tagged chickens, eggs. Bookmark the permalink. Congrats on your eggs. I’d love to have my own fresh eggs, maybe even some of those healthy looking orange yoked ones. Not like the pale yellow ones I get from the store. It really is amazing the variety of chickens there are, I’d probably be a mad chicken collector if I could have them. We cracked open an egg today and couldn’t believe how orange the yolk was. 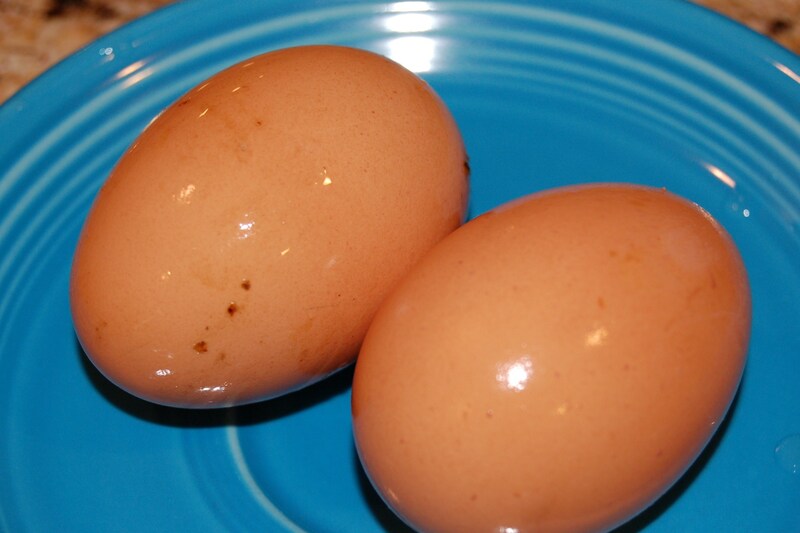 Big difference between store-bought eggs! Congratulations! The surviving chickens must be breathing a lot more easily! Congratulations Sandy and Derek! I just knew they’d be ready soon enough! I hope you start getting the 3 a week per hen that I think is common. Wouldn’t that be nice. Next time try taking a pic of the yoke so we can see the difference! And you don’t eat chicken? We eat TONS of it. Much better for you then red meat. Of course, if I had hens I’m not sure I’d want to eat them! I have 5 ladies and get 2-3 eggs a day, mine are heirloom breeds not hybrid layers, but they are great company, ideal pets, and I love their eggs. I had a mushroom and chookie egg omlette for breakfast this morning – delicious! lol. glad the chickens are still around. the pic of the eggs on the blue fiesta plate is very pretty. Soooo…this page is essentially a web page for your project of starting the garden and increasing the level of sustainability in your home. Very cool. Maybe I’ll start one on bipolar disorder and my project of getting healthy, helping my parents get healthy and getting back here to Portland to finish/restart the MURP program.